With an invitation from my old-time blogger friend Sherman, we tried Mosaic’s latest Taiwanese Tasting Menu. 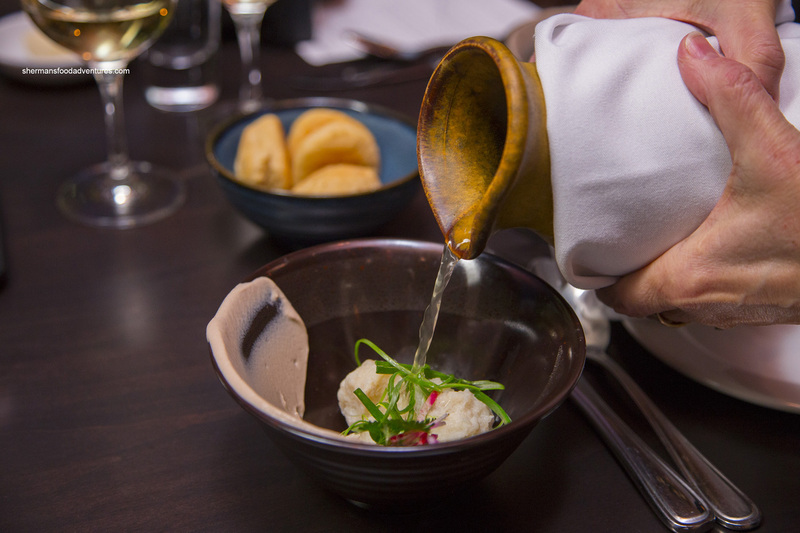 Inspired by his recent visit to Taiwan, executive chef Thomas Heinrich put out this 4-course menu with a wine pairing option. Based on my experience last year, I was quite looking forward to another fantastic dinner. The dinner started with the Fish Ball with Scallion & Pork Dust. The house-made fish balls were made with ling cod, scallop and ground pork. Because the texture of ling cod and scallop is on the soft side, and I’m used to the bouncy, ping-pong like fish balls from HK, I found these a bit mushy. But the use of a little bit ground pork added some chew to it. The broth was quite aromatic and you could definitely taste the ginger and scallion; it had a homey taste to it. When mixing in the porcini paste on the side of the bowl (although not necessarily the most appetizing looking) there was some additional earthy note to the broth. Unfortunately our server poured a bit too much broth so I couldn’t finish it all. 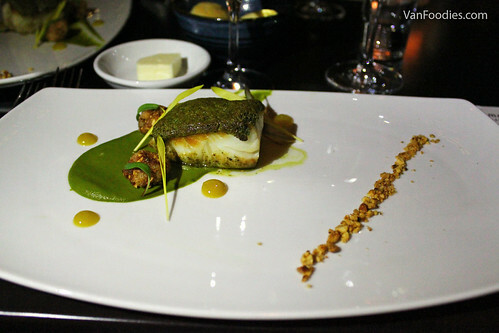 Our second course was the Hakka Tea Crusted Ling Cod, and it was my favourite plate of the evening. Hakka Tea is typically made from crushed oolong tea leaves, sesame seeds and peanuts, and maybe some other nuts and grains. The peanut flavour was very prominent in this dish, found in the crust, the mochi and the garnish, and worked quite well with the flaky ling cod. Taiwanese cuisine does have some Japanese influence and I was able to find hints of Japanese matcha in the Hakka tea crust. The whole dish was rounded out by the slightly tart lemon vinegar fluid gel. I personally also liked the pairing of Cedar Creek’s ‘Platinum’ Block 5 Chardonnay with this dish. The slightly oaky, dry white wine went really well with the ling cod. 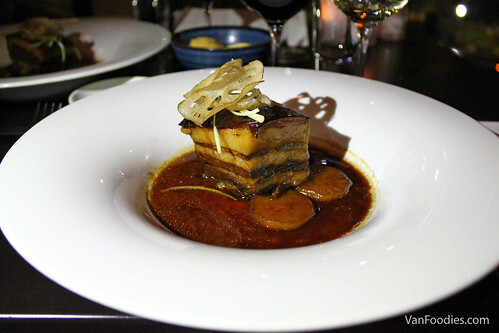 The 5-Spiced Braised Pork Belly reminds me of Dongpo Pork, which you may find in many Shanghainese restaurants. The pork belly was braised to perfection — meat was tender, skin was still a bit gelatinous, and the fatty part just melted in your mouth. It’s fatty but not greasy. You just may feel guilty finishing it (I didn’t, though). The lotus root chips added some contrast in texture and were the crunchy element of the plate. This was a close second to be my favourite dish, only because I’m more familiar with the flavours of this dish and didn’t find it as interesting and creative as the ling cod. 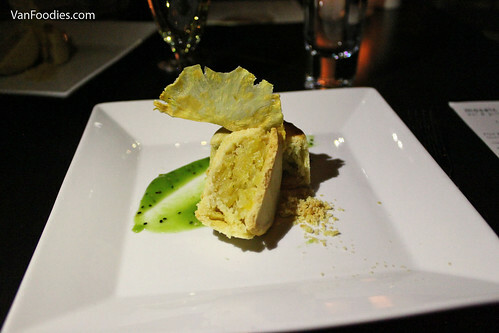 Our meal ended with Chef’s take on a Taiwanese classic, the Pineapple Cake. It’s commonly found in Taiwan and it’s often being gifted on special occasions. I did like this version of the pineapple cake. The crust was buttery and crumbled just a little bit. The pineapple was chopped finely but still recognizable. For some reason, I tasted sour plum in the green kiwi sauce, but it’s just straight-up kiwi puree. What’s missing in the picture below is a scoop of black sesame ice cream, which came separately for us. Not a super sweet finish to our evening but the acidity in this dessert helped balance out the richness of the pork belly. This menu is not about presenting the authentic Taiwanese flavours. In fact, I appreciate Chef Thomas’ own twist to the flavour profiles that he experienced when he was visiting Taiwan. Some of the flavours are definitely familiar to me, but I also found new elements in his dishes that I had thoroughly enjoyed. This was another great delivery by Chef Thomas Heinrich. I’m definitely going to miss him and his food as he takes on a new adventure in the near future.